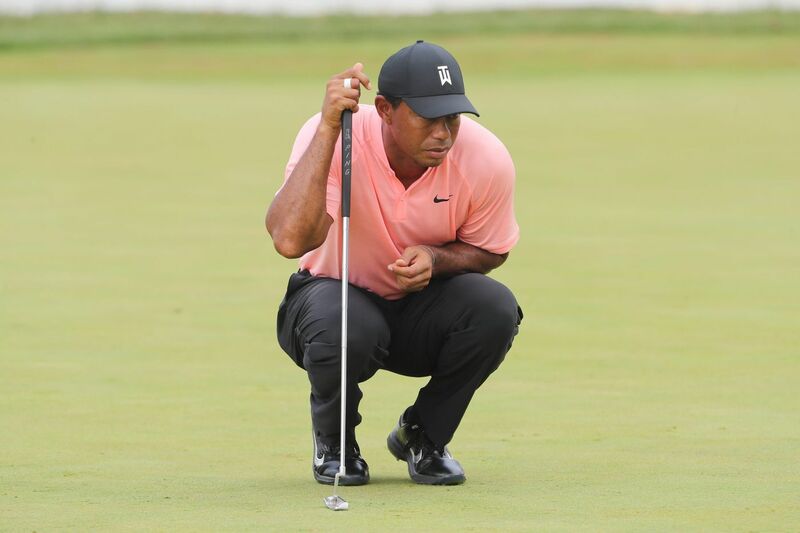 Tiger Woods lines up a putt on the 18th hole at Aronimink. As the sun came out to play Friday morning, so too did Tiger Woods. Despite favorable scoring conditions, including soft greens, Woods could not build on his 8-under-par 62 from the first round of the BMW Championship at Aronimink Golf Club. "As soft as the golf course was, they had a lot of back pins, and I couldn't get back there, couldn't skip the ball back there," Woods said after a shooting an even-par 70 on Day 2. "You don't want to go long. You don't want to carry it past the hole and skip over the back. It was a difficult task to try and flight one back there without, you know, hitting it over the back." Woods began the day in the lead after posting his best opening score since the Byron Nelson in 1999. But he didn't get off to the start he had in the first round. "Very simple. I didn't make any putts," Woods said of the difference between the two days. "I hit a lot of beautiful putts that were on top of the edge and then I hit a couple of bad ones on the last hole, but overall, it looked like all the putts were going to go in." He bogeyed the fifth hole, pushing him to 7 under. At the ninth hole, he birdied, bringing him to even par for the day. At the 11th hole, Woods made a short birdie putt to move to 9 under. His two-putt birdie at the par-5 16th got him to 10 under, but on the last two holes, he struggled with his putter. His 70 left him at 8-under 132, tied for 12th entering the final two rounds. Woods struggled on the four par-3s, going 2 over par. "Making a bogey with a sand wedge in my hand is not very good," Woods said, referring to the fifth hole. "Dumping the ball in the bunker at 17 also is not very good. I got to hit better shots on the par-3s, for sure." Woods' focus entering the third round is to make more birdies and take advantage of the soft greens, which he feels can play to his favor. "I got to make birdies and try to keep pace, and this golf course is playing soft and getable and tomorrow will be the same thing," he said. Entering the BMW Championship, Woods was in the clear to move on to the Tour Championship. He began the week ranked 25th in the FedEx Cup point standings, and the top 30 will advance to the final tournament of the FedEx playoffs. After the Tour Championship, Sept. 20-23 in Atlanta, Woods will compete in the Ryder Cup in Paris.